Converting Africa’s impressive economic performance over the past decade into greater gains on the Millennium Development Goals (MDGs) remains a primary challenge for Africa, according to a new report. Released today, The MDG Report 2013: Assessing progress in Africa toward the Millennium Development Goals concludes that while Africa is the world’s second fastest growing region, its rate of poverty reduction is insufficient to reach the target of halving extreme poverty by 2015. Converting Africa’s impressive economic performance over the past decade into greater gains on the Millennium Development Goals (MDGs) remains a primary challenge for Africa, according to a new report. Released today, The MDG Report 2013: Assessing progress in Africa toward the Millennium Development Goals concludes that while Africa is the world’s second fastest growing region, its rate of poverty reduction is insufficient to reach the target of halving extreme poverty by 2015. The progress report, prepared by the African Union Commission (AUC), UN Economic Commission for Africa (ECA), UN Development Programme (UNDP), and the African Development Bank Group (AfDB), was launched on the final day of the African Union Summit. An analysis of food insecurity – the report’s theme – provides insights into how this phenomenon impacts other MDGs, particularly health-related goals, and how concerted efforts to improve agriculture, food distribution and nutrition would fast-track progress towards other MDGs. The report reveals that climate-related shocks manifested by extreme weather conditions have destroyed livelihoods and exacerbated Africa’s food insecurity, resulting in a high incidence of underweight children, widespread hunger and poor dietary consumption patterns. With fewer than 1,000 days until the 2015 target for the MDGs, the report takes stock of Africa’s overall performance on the MDGs and identifies the best performing countries by indicator, based on progress relative to each country’s initial conditions. The report concludes it is imperative that countries continue to learn from one another, as the countries that have sustained, equitable growth, with political stability and human development-oriented policies, are doing well in most of the goals. On track: MDG 2 – Achieve universal primary education; MDG 3 – Promote gender equality and empower women; MDG 6 – Combat HIV/AIDS, TB, malaria and other diseases; and MDG 8 – Global partnership for development. Off track: MDG 1 – Eradicate extreme poverty and hunger; MDG 4 – Reduce child mortality; MDG 5 – Improve maternal health; and MDG 7 – Ensure environmental sustainability. Yet, some countries recorded appreciable progress. Importantly, the report argues that Africa must put structures in place to sustain its development well beyond the MDG timeline. 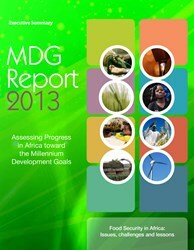 “We hope that this report inspires and energizes member states to accelerate efforts towards the MDGs. Further, we recommend that the post-2015 development agenda consider the initial conditions of nation-states and recognize countries’ efforts towards the goals, as opposed to just measuring how far they fall short,” states the report’s foreword, co-signed by the AUC Chairperson Nkosazana Dlamini Zuma; UNECA Executive Secretary Carlos Lopes; AfDB President, Donald Kaberuka; and UNDP Administrator, Helen Clark. “Africa must commit to inclusive, transformative development that reduces income poverty, creates decent jobs, enhances access to social services, reduces inequality and promotes resilience to climate-related hazards,” the foreword continues. This year’s progress report covers a gamut of issues and policy recommendations, and reveals a mixed pattern of successes, challenges, innovations and obstacles. Attending primary school is becoming the norm but the quality of education remains a challenge – most African countries have achieved universal primary school enrolment, with rates above 90 per cent, and the continent as a whole is expected to achieve MDG 2. School food programmes and access to pre-schools have been instrumental to progress. Encouraging progress toward gender parity – Women across Africa are becoming more empowered, with more girls attending both primary and secondary school, and more women in positions of political power. But cultural practices such as early marriage and low economic opportunities for women are slowing progress. Africa has halted the spread of HIV/AIDS, tuberculosis and malaria – thanks to strong political leadership, targeted interventions and the availability of AIDS medicine to the majority of people, and improved prevention and treatment efforts for TB and malaria. Hunger and malnutrition rates remain high in Africa, especially among children – In 2012, most of Africa was identified as having serious to alarming levels of hunger on the Global Hunger Index. Food insecurity has played a large role in slowing progress on the health MDGs, especially for children and mothers. Climate change, political instability and population growth are among the contributing factors. The continent’s population is increasing so rapidly that countries might not be able to produce all the food they need. Africa still has the greatest burden of child and maternal deaths, although significant progress has been made – under-five child deaths fell by 47 per cent across Africa between 1990 and 2011. To fast-track progress, this year’s MDG report highlights the importance of integrated maternal and child health interventions, focusing on infant mortality and the need for holistic policies that address the underlying causes of maternal and child deaths. Overall Africa’s contribution to global trade is largely unchanged, at around 3 percent – The proportion of developed country imports from Africa (admitted duty free) has generally stagnated for most countries, but increased by more than 50 percent for 14 African countries. The livelihoods of countless African households will be at risk without efforts to improve resilience to environmental hazards – including those attributable to climate change. Sustaining progress on the MDGs will require strengthening capacities to anticipate and respond to climate-related disasters and capitalizing on green growth opportunities. Most African countries are struggling to meet targets in water and sanitation – Countries must concentrate efforts in rural areas and low-income groups as urban-rural income disparities in access are holding back progress in most countries. Africa as a whole is doing well in terms of reducing carbon dioxide emissions and ozone depleting substances, yet forest cover is decreasing. African governments need to put in place afforestation strategies and programmes. African governments should constantly expand the agricultural-productivity frontier, for example through policies that support the application of local knowledge, infrastructure investments and the development of financial markets. Accelerating the creation of decent jobs will require bold policy changes that promote value added activities, economic diversification and investment in infrastructure. The report argues that policy-makers must pursue inclusive growth strategies that promote broad participation of the active labour force while ensuring that the returns from growth are invested in programmes that enhance the productive capacities of broad segments of society, particularly women, young people and the vulnerable. To transform Africa’s agriculture for improved livelihoods and economic empowerment, African governments need to keep expanding agricultural productivity through better policies and heavy investment in improved seedlings, irrigated farming, use of fertilizers and increased access to finance. The MDG Report 2013 and its Executive Summary are available in English, French and Arabic via: http://www.afdb.org/en/knowledge/publications/millennium-development-goals-mdgs-report/ and http://www.undp.org/content/undp/en/home/librarypage/mdg/mdg-reports/africa-collection/.